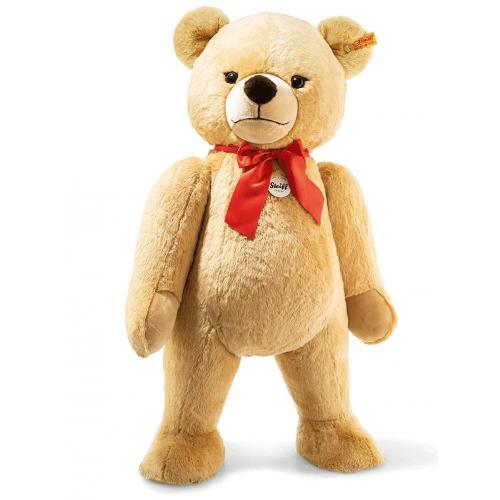 Steiff Studio Petsy Teddy Bear is from the Steiff Classic collection and made in beautiful blond soft woven fur. 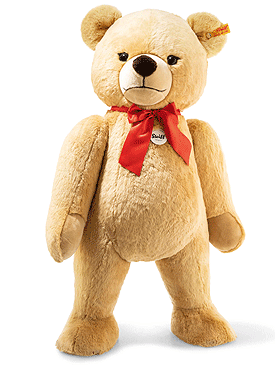 At a height of 150 cm, Studio Petsy is a remarkable Teddy bear. He is made of incredibly soft faux fur. Thanks to the frame built into his body, Petsy can stand up unassisted. The corners of his eyes as well as his mouth and the bridge of his nose are painted in a way that contrasts his dark brown nose. Studio Petsy has three joints: His arms and head can move. The red bow sewn around his neck really ties together his eye-catching look.